CHELMSFORD — At the new Nobo Restaurant, the “no boundaries” motto applies to much more than food. With a menu boasting dishes such as Kobe beef and American cheese spring rolls, teriyaki-glazed rack of lamb and torched Ahi tuna with shredded spicy crab, the owners knew the restaurant needed bold, contemporary art with an Asian flair to match its adeptly fused Japanese, Pan-Asian and western cuisine. “Everything from our decor to our menu to the type of service that we are providing to our customers, we are all about pushing the boundaries of what you typically expect if you went to a typical Japanese restaurant,” said Julian Yu, who runs the restaurant with his parents and siblings. Nobo is a truly family operation for the Yus, with parents Theresa Yu serving as general manager and Peter Yu as bar manager. Their sons, Julian and Jonathan, manage dining and operations, respectively, while daughter Tiffany is in charge of marketing. Having recently relocated from Amherst, N.H., to open the restaurant, the Yu family felt it was important to have local folks help carry out their vision for how the establishment should look and feel. 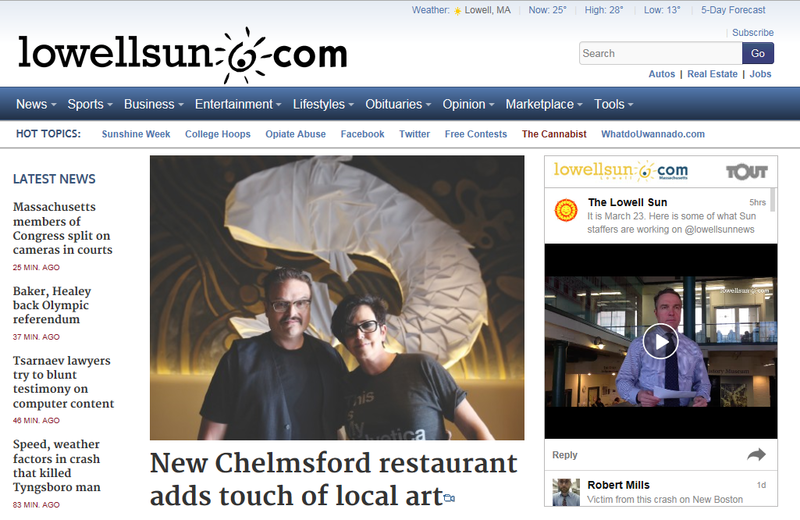 They hired Chelmsford artists Markus and Leslie Lewis, a husband-and-wife team of 30 years, to paint three large murals at Nobo. Leslie Lewis also created three enormous, origami-inspired koi fish sculptures, the longest measuring 14 feet from nose to tail, that are suspended from the wall in the main dining room. “We worked beautifully together,” said Markus Lewis. “I couldn’t have thought of an easier fit to be able to get their artistic expression and our artistic interpretation to meld so well. Using earth tones and metallic colors on a black background for the murals, he found himself interpreting koi ponds in hues not traditionally used for water. In a hybrid between super graphic illustration style and traditional Asian, Markus Lewis free-hand-painted the waves and bubbles that form the backdrop for the giant origami koi created by his wife. “They’re made out of everything you’d find in a typical painting — canvas, wood, metal,” said Leslie Lewis, who didn’t want to share the technique she created specially for this project. In the bar and lounge area mural, giant koi fish of red and gold swim onto and off of the wall. Koi were chosen for the decor because they are an auspicious symbol in Asian culture, Theresa Yu said. “We wanted the feeling of fluidity, of effortless movement, a place to relax and chill out but yet things are not stagnant,” said Markus Lewis. The gold and earth tone pagoda scene at the entrance of the restaurant was inspired by a traditional piece owned by Theresa Yu, he said. The partnership between the Yus and the Lewises didn’t end after the commissioned work was completed. The Lewises will hold monthly painting parties at the restaurant, and on May 2, Nobo will be a stop for Boston Art Week. That event will “merge food and art as one,” Markus Lewis said, with artists using traditional sushi ingredients as their medium and plates as their canvases. In the meantime, the Yu family will be working on further embedding themselves and Nobo into the community, being involved in and supporting local events. 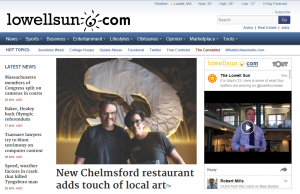 They hope to gain a following here as loyal as the customers of their previous New Hampshire restaurant that still drive an hour and a half to partake in their offerings.